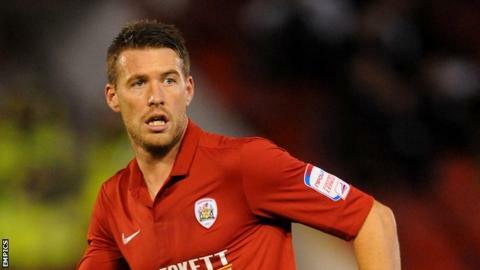 Wales and Barnsley defender Rob Edwards believes his loan deal with Fleetwood is ideal for both parties. The 29-year-old former Blackpool player is looking to rebuild match fitness after a period disrupted by injury. Edwards told BBC Radio Lancashire: "Fleetwood is a club on the up, everything about it is top notch. "I'm desperate to get playing and enjoying my football again, and with Fleetwood picking up one or two injuries it works well for both of us." Edwards, who still lives on the Fylde coast in nearby Lytham, acknowledged that having only recently recovered from his latest injury, a hip problem, he was unlikely to force his way straight back into the Barnsley first team picture. "Things have been a bit up and down for me at Barnsley - when I signed there last year it started well in pre-season, I was made captain and it was going really well but then I got one or two injuries dring the season and it sort of tailed off. "It's been the same sort of story this season, I picked up an injury before the start of the season and have been out since. "I literally only started training last week, so I wouldn't be expecting to get straight back involved at Barnsley, so this has come at a great time for me to be playing football again so soon." Edwards admits he has been hugely impressed by what he has seen of the League Two club's set-up. "The lads and the manager have done a great job, the chairman is very single-minded, he wants to go as far as he can as quickly as possible, the pitch is in fantastic condition, it's a great little stadium, so everything is top notch." However he is not looking beyond the one month deal agreed between the clubs. "I don't really want to look too far in to the future, I think that's a problem a lot of us have, setting goals, I just want to enjoy the month, enjoy playing football again and do as well as I can and whatever happens, happens," he said.